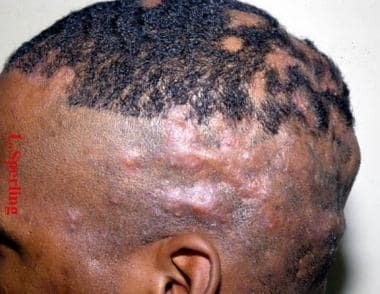 Perifolliculitis capitis abscedens et suffodiens in a black man. Painful cutaneous nodules and patchy alopecia. 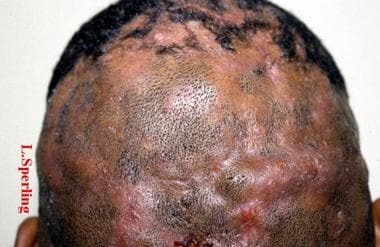 Side view of a black man with painful cutaneous nodules and patchy alopecia, characteristic of perifolliculitis capitis abscedens et suffodiens. Bacterial infection likely develops secondarily, as most bacteriologic cultures are negative. The most frequently isolated pathogens are Staphylococcus aureus, S epidermidis, and S albus. Hoffman E. Perifolliculitis capitis abscedens et suffodiens: case presentation. Dermatol Zeitschrift (Berlin). 1908. 15:122-3. Spitzer L. Dermatitis follicularis et perifollicularis conglobata. Dermatol Zeitschrift (Berlin). 1903. 10:109-20. Varshney N, Al Hammadi A, Sam H, Watters AK. Perifolliculitis capitis abscedens et suffodiens in an 18-year-old Aboriginal Canadian patient: case report and review of the literature. J Cutan Med Surg. 2007 Jan-Feb. 11(1):35-9. [Medline]. Stites PC, Boyd AS. Dissecting cellulitis in a white male: a case report and review of the literature. Cutis. 2001 Jan. 67(1):37-40. [Medline]. Gaopande VL, Kulkarni MM, Joshi AR, Dhande AN. Perifolliculitis Capitis Abscedens et Suffodiens in a 7 Years Male: A Case Report with Review of Literature. Int J Trichology. 2015 Oct-Dec. 7 (4):173-5. [Medline]. Badaoui A, Reygagne P, Cavelier-Balloy B, Pinquier L, Deschamps L, Crickx B, et al. Dissecting cellulitis of the scalp: a retrospective study of 51 patients and review of literature. Br J Dermatol. 2016 Feb. 174 (2):421-3. [Medline]. Chicarilli ZN. Follicular occlusion triad: hidradenitis suppurativa, acne conglobata, and dissecting cellulitis of the scalp. Ann Plast Surg. 1987 Mar. 18(3):230-7. [Medline]. Zisova L, Sakakushev B. Acne tetrad in a family. Folia Med (Plovdiv). 1994. 36(4):51-7. [Medline]. Maintz L, Betz RC, Allam JP, Wenzel J, Jaksche A, Friedrichs N, et al. Keratitis-ichthyosis-deafness syndrome in association with follicular occlusion triad. Eur J Dermatol. 2005 Sep-Oct. 15(5):347-52. [Medline]. Montgomery JR, White TW, Martin BL, Turner ML, Holland SM. A novel connexin 26 gene mutation associated with features of the keratitis-ichthyosis-deafness syndrome and the follicular occlusion triad. J Am Acad Dermatol. 2004 Sep. 51(3):377-82. [Medline]. Prasad SC, Bygum A. Successful treatment with alitretinoin of dissecting cellulitis of the scalp in keratitis-ichthyosis-deafness syndrome. Acta Derm Venereol. 2013 Jul 6. 93(4):473-4. [Medline]. Koshelev MV, Garrison PA, Wright TS. Concurrent hidradenitis suppurativa, inflammatory acne, dissecting cellulitis of the scalp, and pyoderma gangrenosum in a 16-year-old boy. Pediatr Dermatol. 2014 Jan-Feb. 31 (1):e20-1. [Medline]. Syed TA, Ul Abideen Asad Z, Salem G, Garg K, Rubin E, Agudelo N. Dissecting Cellulitis of the Scalp: A Rare Dermatological Manifestation of Crohn's Disease. ACG Case Rep J. 2018. 5:e8. [Medline]. Segurado-Miravalles G, Camacho-Martínez FM, Arias-Santiago S, Serrano-Falcón C, Serrano-Ortega S, Rodrigues-Barata R, et al. Epidemiology, clinical presentation and therapeutic approach in a multicentre series of dissecting cellulitis of the scalp. J Eur Acad Dermatol Venereol. 2017 Apr. 31 (4):e199-e200. [Medline]. Kurtzman DJB, Alexander CE. Image Gallery: Dissecting cellulitis of the scalp following anabolic steroid use. Br J Dermatol. 2017 Oct. 177 (4):e160. [Medline]. Curry SS, Gaither DH, King LE Jr. Squamous cell carcinoma arising in dissecting perifolliculitis of the scalp. A case report and review of secondary squamous cell carcinomas. J Am Acad Dermatol. 1981 Jun. 4(6):673-8. [Medline]. Sivakumaran S, Meyer P, Burrows NP. Dissecting folliculitis of the scalp with marginal keratitis. Clin Exp Dermatol. 2001 Sep. 26(6):490-2. [Medline]. Benvenuto ME, Rebora A. Fluctuant nodules and alopecia of the scalp. Perifolliculitis capitis abscedens et suffodiens. Arch Dermatol. 1992 Aug. 128(8):1115-7, 1118-9. [Medline]. Ramesh V. Dissecting cellulitis of the scalp in 2 girls. Dermatologica. 1990. 180(1):48-50. [Medline]. Tosti A, Torres F, Miteva M. Dermoscopy of Early Dissecting Cellulitis of the Scalp Simulates Alopecia Areata. Actas Dermosifiliogr. 2012 Jul 30. [Medline]. Segurado-Miravalles G, Camacho-Martınez F, Arias-Santiago S, Rodrigues-Barata R, Serrano-Falcón C, Moreno-Arrones OM, et al. Trichoscopy of dissecting cellulitis of the scalp: Exclamation mark hairs and white dots as markers of disease chronicity. J Am Acad Dermatol. 2016 Dec. 75 (6):1267-1268. [Medline]. Verzì AE, Lacarrubba F, Micali G. Heterogeneity of trichoscopy findings in dissecting cellulitis of the scalp: correlation with disease activity and duration. Br J Dermatol. 2017 Dec. 177 (6):e331-e332. [Medline]. Salim A, David J, Holder J. Dissecting cellulitis of the scalp with associated spondylarthropathy: case report and review. J Eur Acad Dermatol Venereol. 2003 Nov. 17(6):689-91. [Medline]. Libow LF, Friar DA. Arthropathy associated with cystic acne, hidradenitis suppurativa, and perifolliculitis capitis abscedens et suffodiens: treatment with isotretinoin. Cutis. 1999 Aug. 64(2):87-90. [Medline]. Miletta NR, Schwartz C, Sperling L. Tinea capitis mimicking dissecting cellulitis of the scalp: a histopathologic pitfall when evaluating alopecia in the post-pubertal patient. J Cutan Pathol. 2014 Jan. 41 (1):2-4. [Medline]. Abdennader S, Vignon-Pennamen MD, Hatchuel J, Reygagne P. Alopecic and aseptic nodules of the scalp (pseudocyst of the scalp): a prospective clinicopathological study of 15 cases. Dermatology. 2011 Feb. 222(1):31-5. [Medline]. Sperling LC. Scarring alopecia and the dermatopathologist. J Cutan Pathol. 2001 Aug. 28(7):333-42. [Medline]. Bjellerup M, Wallengren J. Familial perifolliculitis capitis abscedens et suffodiens in two brothers successfully treated with isotretinoin. J Am Acad Dermatol. 1990 Oct. 23(4 Pt 1):752-3. [Medline]. Koca R, Altinyazar HC, Ozen OI, Tekin NS. Dissecting cellulitis in a white male: response to isotretinoin. Int J Dermatol. 2002 Aug. 41(8):509-13. [Medline]. Omulecki A, Dabkowski J, Zak-Prelich M. Perifolliculitis capitis abscedens et suffodiens--a case report. Med Sci Monit. 2000 May-Jun. 6(3):602-4. [Medline]. Schewach-Millet M, Ziv R, Shapira D. Perifolliculitis capitis abscedens et suffodiens treated with isotretinoin (13-cis-retinoic acid). J Am Acad Dermatol. 1986 Dec. 15(6):1291-2. [Medline]. Jacobs F, Metzler G, Kubiak J, et al. New approach in combined therapy of perifolliculitis capitis abscedens et suffodiens. Acta Derm Venereol. Oct 2011. 91(6):726-7. Karpouzis A, Giatromanolaki A, Sivridis E, Kouskoukis C. Perifolliculitis capitis abscedens et suffodiens successfully controlled with topical isotretinoin. Eur J Dermatol. 2003 Mar-Apr. 13(2):192-5. [Medline]. Georgala S, Korfitis C, Ioannidou D, Alestas T, Kylafis G, Georgala C. Dissecting cellulitis of the scalp treated with rifampicin and isotretinoin: case reports. Cutis. 2008 Sep. 82(3):195-8. [Medline]. Bolz S, Jappe U, Hartschuh W. Successful treatment of perifolliculitis capitis abscedens et suffodiens with combined isotretinoin and dapsone. J Dtsch Dermatol Ges. 2008 Jan. 6(1):44-7. [Medline]. Greenblatt DT, Sheth N, Teixeira F. Dissecting cellulitis of the scalp responding to oral quinolones. Clin Exp Dermatol. 2008 Jan. 33(1):99-100. [Medline]. Berne B, Venge P, Ohman S. Perifolliculitis capitis abscedens et suffodiens (Hoffman). Complete healing associated with oral zinc therapy. Arch Dermatol. 1985 Aug. 121(8):1028-30. [Medline]. Kobayashi H, Aiba S, Tagami H. Successful treatment of dissecting cellulitis and acne conglobata with oral zinc. Br J Dermatol. 1999 Dec. 141(6):1137-8. [Medline]. Brandt HR, Malheiros AP, Teixeira MG, Machado MC. Perifolliculitis capitis abscedens et suffodiens successfully controlled with infliximab. Br J Dermatol. 2008 Aug. 159(2):506-7. [Medline]. Navarini AA, Trüeb RM. 3 cases of dissecting cellulitis of the scalp treated with adalimumab: control of inflammation within residual structural disease. Arch Dermatol. 2010 May. 146(5):517-20. [Medline]. Sukhatme SV, Lenzy YM, Gottlieb AB. Refractory dissecting cellulitis of the scalp treated with adalimumab. J Drugs Dermatol. 2008 Oct. 7(10):981-3. [Medline]. Wollina U, Gemmeke A, Koch A. Dissecting Cellulitis of the Scalp Responding to Intravenous Tumor Necrosis Factor-alpha Antagonist. J Clin Aesthet Dermatol. 2012 Apr. 5(4):36-9. [Medline]. [Full Text]. Mansouri Y, Martin-Clavijo A, Newsome P, Kaur MR. Dissecting cellulitis of the scalp treated with tumour necrosis factor-α inhibitors: experience with two agents. Br J Dermatol. 2015 Nov 2. [Medline]. Asemota E, Chang YC, Goldberg LJ. Innovative Management of Recalcitrant Dissecting Cellulitis With Compression Therapy. JAMA Dermatol. 2016 Nov 1. 152 (11):1280-1281. [Medline]. Glass LF, Berman B, Laub D. Treatment of perifolliculitis capitis abscedens et suffodiens with the carbon dioxide laser. J Dermatol Surg Oncol. 1989 Jun. 15(6):673-6. [Medline]. Boyd AS, Binhlam JQ. Use of an 800-nm pulsed-diode laser in the treatment of recalcitrant dissecting cellulitis of the scalp. Arch Dermatol. 2002 Oct. 138(10):1291-3. [Medline]. Chui CT, Berger TG, Price VH, Zachary CB. Recalcitrant scarring follicular disorders treated by laser-assisted hair removal: a preliminary report. Dermatol Surg. 1999 Jan. 25(1):34-7. [Medline]. Krasner BD, Hamzavi FH, Murakawa GJ, Hamzavi IH. Dissecting cellulitis treated with the long-pulsed Nd:YAG laser. Dermatol Surg. 2006 Aug. 32(8):1039-44. [Medline]. McMullan FH, Zeligman I. Perifolliculitis capitis abscedens et suffodiens; its successful treatment with x-ray epilation. AMA Arch Derm. 1956 Mar. 73(3):256-63. [Medline]. Chinnaiyan P, Tena LB, Brenner MJ, Welsh JS. Modern external beam radiation therapy for refractory dissecting cellulitis of the scalp. Br J Dermatol. 2005 Apr. 152(4):777-9. [Medline]. Paul S, Bach D, LeBoeuf NR, Devlin PM, Lipworth AD. Successful use of brachytherapy for a severe hidradenitis suppurativa variant. Dermatol Ther. 2016 Nov. 29 (6):455-458. [Medline]. Bellew SG, Nemerofsky R, Schwartz RA, Granick MS. Successful treatment of recalcitrant dissecting cellulitis of the scalp with complete scalp excision and split-thickness skin graft. Dermatol Surg. 2003 Oct. 29(10):1068-70. [Medline]. Moschella SL, Klein MH, Miller RJ. Perifolliculitis capitis abscedens et suffodiens. Report of a successful therapeutic scalping. Arch Dermatol. 1967 Aug. 96(2):195-7. [Medline]. Hintze JM, Howard BE, Donald CB, Hayden RE. Surgical Management and Reconstruction of Hoffman's Disease (Dissecting Cellulitis of the Scalp). Case Rep Surg. 2016. 2016:2123037. [Medline]. Liu Y, Ma Y, Xiang LH. Successful treatment of recalcitrant dissecting cellulitis of the scalp with ALA-PDT: case report and literature review. Photodiagnosis Photodyn Ther. 2013 Dec. 10(4):410-3. [Medline]. Shaffer N, Billick RC, Srolovitz H. Perifolliculitis capitis abscedens et suffodiens. Resolution with combination therapy. Arch Dermatol. 1992 Oct. 128(10):1329-31. [Medline]. Dubost-Brama A, Delaporte E, Alfandari S, Piette F, Bergoend H. [Perifolliculitis capitis abscedens and suffidiens. Efficacy of isotretinoin]. Ann Dermatol Venereol. 1994. 121(4):328-30. [Medline]. A white patient with painful nodules. Image used with permission from Medical Science Monitor, 2000, 6(3): 602-4. A white patient with painful nodules after 3 months of isotretinoin treatment. Image used with permission from Medical Science Monitor, 2000, 6(3): 602-4. Histopathologic picture of biopsy taken from a white patient with perifolliculitis capitis abscedens et suffodiens. Hematoxylin and eosin stain, original magnification 400X. Image used with permission from Medical Science Monitor, 2000, 6(3): 602-4.